The Industrial Revolution followed and built on the Renaissance. 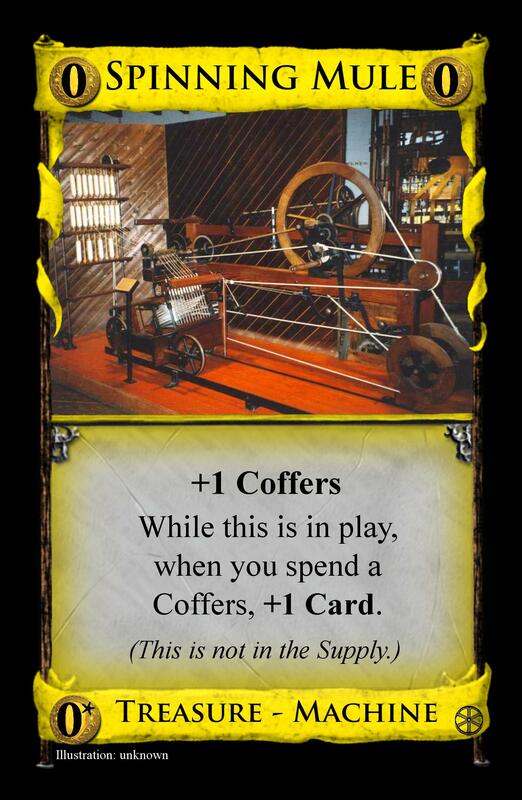 So does this fan set, borrowing all of Renaissance's mechanics with the aim of making cards calling for good skill. You can put it with any of the official sets, though you'll probably want Renaissance for its components. Mechanics: new ones in -1 Action, a 'waiting area' for delaying cards from entering deck, and landscapes you buy once that do something only right away. 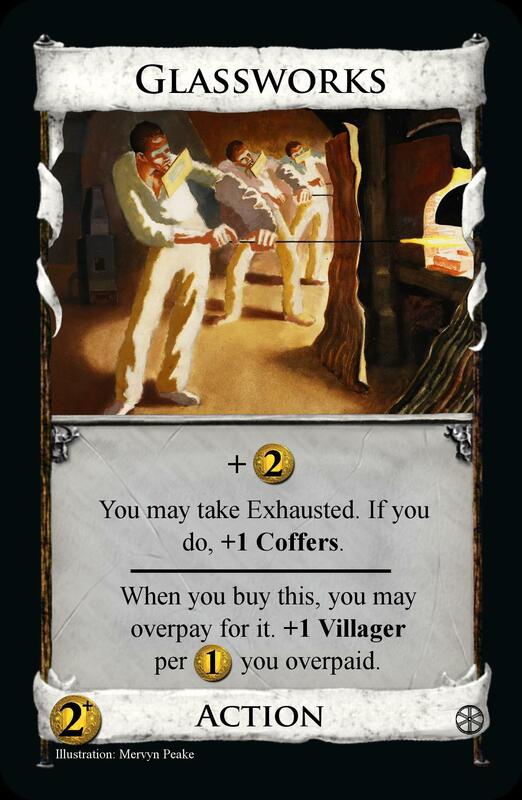 Also Durations, Coffers, Villagers, Artifacts, overpaying, non-Supply cards. Unlike Renaissance, simplicity hasn't been a focus. New mechanics explained after the list of cards below. Click a card to enlarge it. When you next have unused Actions (Actions, not Action cards) during your Action Phase, immediately return this and -1 Action. Villagers make getting +1 Action much easier. So here's the opposite, -1 Action; just like the -$1 token but for Actions. After you take Exhausted, whenever you next have 1 or more Actions left during your Action phase, you immediately lose one and return this, whether you're in the middle of resolving an Action or not. If you end your Action phase still having Exhausted, it will stay over to next turn, and be returned right at the start to take away your starting Action. You could spend a Villager at any time during your Action phase to return this at any time; this can be quite important to pay off Exhausted at turn start to enable the Action phase. And you're only allowed one Exhausted at a time, for simplicity and balance reasons. Non-Victory cards you buy are gained onto this (they are not in play). After your Buy phase, for every $1 unspent you may discard a card on this. When the last card is discarded, return this. From a setback to get around at the Action phase, to one at the Buy phase. Every card you buy that generally improves your deck gets delayed from entering it until you buy them in for $1 more, though if you can get a card to be gained elsewhere you can avoid this. There are other ways to delay cards besides buying them. 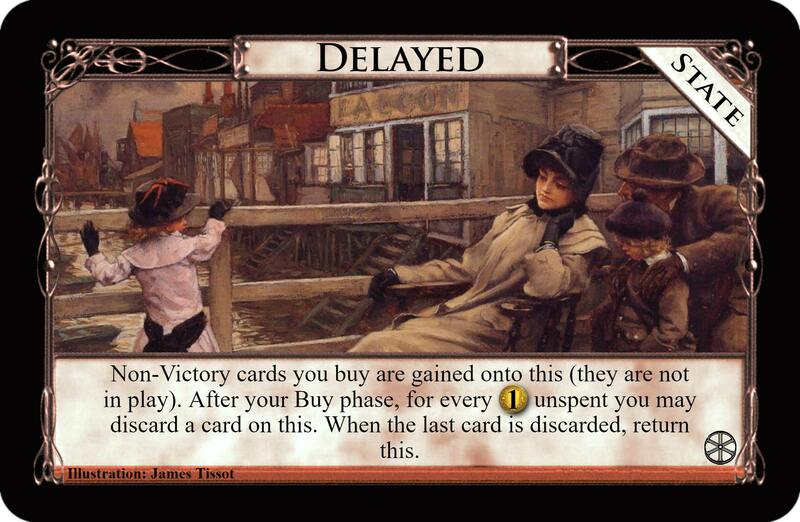 Each card that uses Delayed does so in different ways, so more explanation at each one. Overall, you have to consider not only the extra $ you need to get your cards, but also when to get them. Just like Projects, they're effects you buy once and then put a cube on. But unlike Projects, they are one-offs that happen straight away rather than effects that last for the rest of the game. So the cubes are used to track that you have bought the Prospect and can't get it again. An explanation of each card, then my thoughts on its design positives (+) and negatives (-). I have confidence in every card here; I only mention the negatives to keep modest and realistic, and maybe they raise helpful points. There are plenty of interactions between these cards (it's a set), which I keep quiet about so you can have the fun of finding them out. Some reflect Renaissance, others don't. Advancing Village - Action, $4 cost. When you gain this, gain a Silver onto your deck. When you trash this, gain a card from the trash costing from $3-$6 other than Advancing Village. This first card has none of the special mechanics at all! Well the story is I wasn't going to make a set called Revolution and not have an Advancing Village, they're kind of the whole story of an industrial revolution. 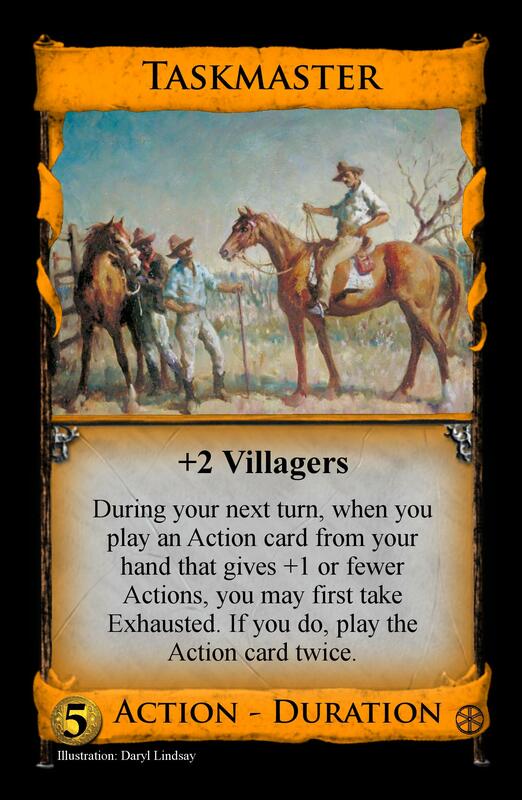 A Village efficient with giving Actions, but is hard to connect to Action cards. 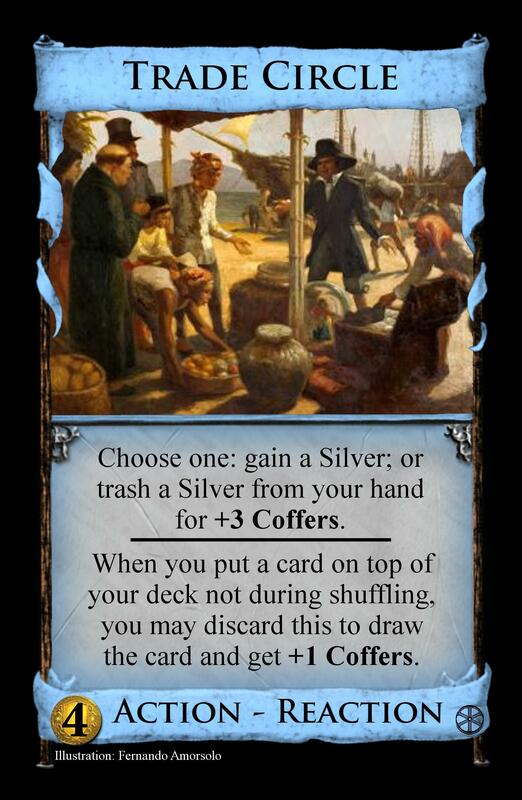 You may just want to buy a Silver for next turn, in which case you can have the Village advance into something nice in the trash. +: you almost always need a Village in a kingdom, so a more niche one like this can still be bought often enough. -: it needs all that specification for gaining from the trash to avoid infinite loops with Watchtower and Tomb. Antique - Treasure, $2* cost. While this is in play, cards cost $1 less, but not less than $0. When you discard this from play, return it to the Supply. This can't cost less than $2. When you buy this, +1 Buy. Antiques can make great collections and can be powerful trade resources. This always costs $2, doesn't use a buy, but is only played once. The more you can collect and play at once, the better potential payout, but there are times where the odd one can be picked up. +: it adds competitiveness and can involve resource control skill to use well. -: the sheer power of 8 played together being an instant 9 Provinces could put too much pressure on games, especially 2-player. Chemist - Action, $4 cost. Choose one: discard a card for +1 Villager; or spend a Villager for +1 Card. Chemical industries improved significantly. 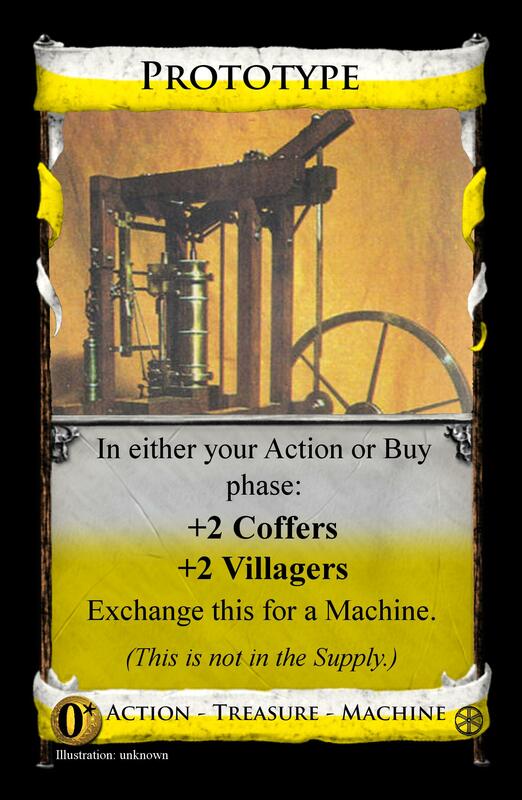 This has two modes, shrink hand to collect Villagers or enlarge hand by spending Villagers. This Villager spending still gives extra Actions (do I need to write that on specifically?) so it's the Lost City effect, and is separate from spending Villagers normally. +: it's simple resource management and mega turn draw potential. Colliery - Action, $7 cost. Take Exhausted. If you do, + $1 per Action you have in play. Coal mines fuelled the factories, with an infamous amount of manpower. Here's the first card using Exhausted; it's effectively a double Action, one card that uses two Actions on play. If you play it and already have Exhausted (that'd be by Thrones or by playing it at the Buy phase), you just get a Buy. Played 'properly' it can give impressive payload, but can be hard to play well in multiples. +: simple and hopefully effective. -: it rewards a condition that's often positive in itself, so could be too strong to realistically do. Components is one big group to look at. I've put it last. Diary - Treasure, $4 cost. When you play this, you may put a card from your hand onto your deck for +1 Villager. The diary could be a treasure to the common worker, letting him recount his daily toil. A simple one, put something back onto the deck and get a Villager. It sorts out terminal Action collisions, but getting Villagers outside the Action phase has its advantages anyway. +: others have called this elegant, and I agree. -: it could be too strong with terminal draw, even though it 'reverses' a card, and $4 might be too cheap for this strictly better Silver. Dismiss - Action, $3 cost. You may discard a card, to reveal cards from your deck until you reveal a differently named card that shares a type. Put it into your hand and discard the rest. Change a card in your hand for one in your deck that you need more right now, be it an Action you need to play earlier in the turn, or a better Treasure, or an actually useful Victory, etc. +: a card that will help any deck and is failsafe to pick up, but better skill enhances how useful it is. Diversion - Action Attack, $5 cost. Each other player takes Delayed. Those with 5 or fewer cards on it reveal the top 2 cards of their deck, put one non-Victory onto it then discard the rest. Set up a cheeky detour for your opponents' goods. One of the cards using Delayed, giving it out as an Attack. You can only be Delayed once, so if opponents already have it they don't need to do anything here. 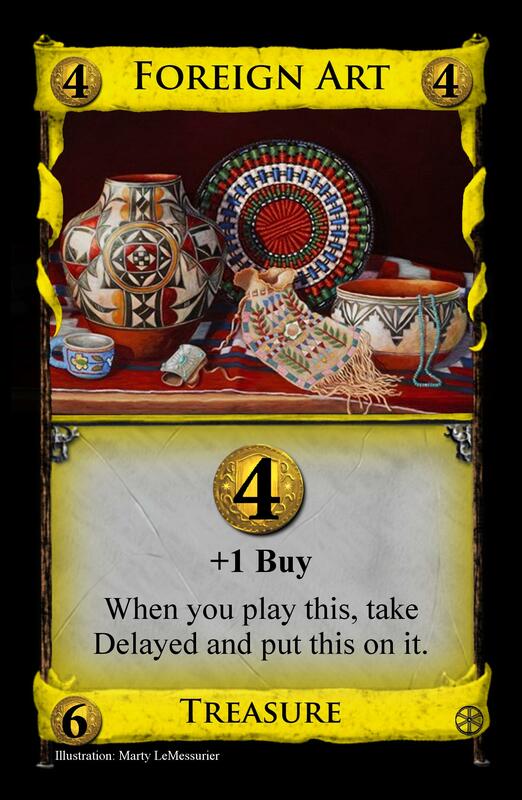 As well as the buying setback, this then delays cards right from their decks; nothing says Delayed can only hold bought cards. This means they can have a card miss a shuffle and it be like an implied - $1 token. Or more shuffles are missed if that $1 isn't paid. To balance this, the delay from deck only works with 5 or fewer cards delayed, and can work on junk cards. Opponents can take advantage of this, but at a permanent cost to their non-Victory buys. +: it's a different way to Attack. That's one advantage to making new mechanics. -: overall it could be too weak or generous an attack. Entrepreneur - Action Reaction, $2 cost. 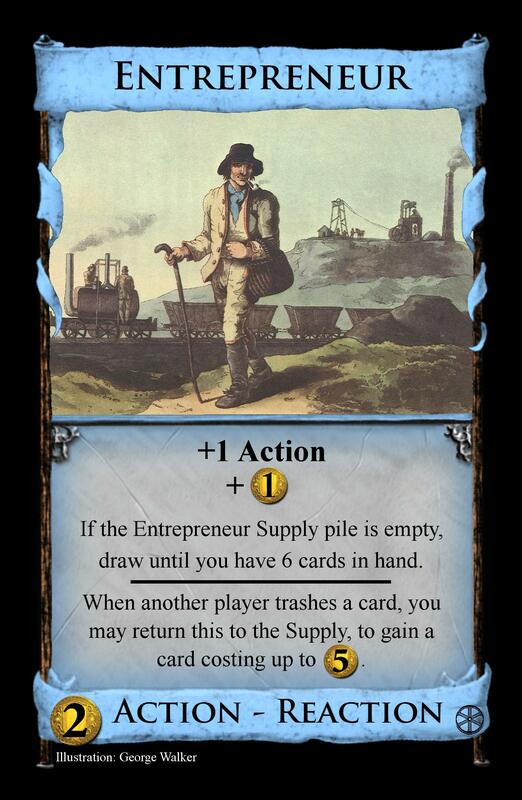 If the Entrepreneur Supply pile is empty, draw until you have 6 cards in hand. 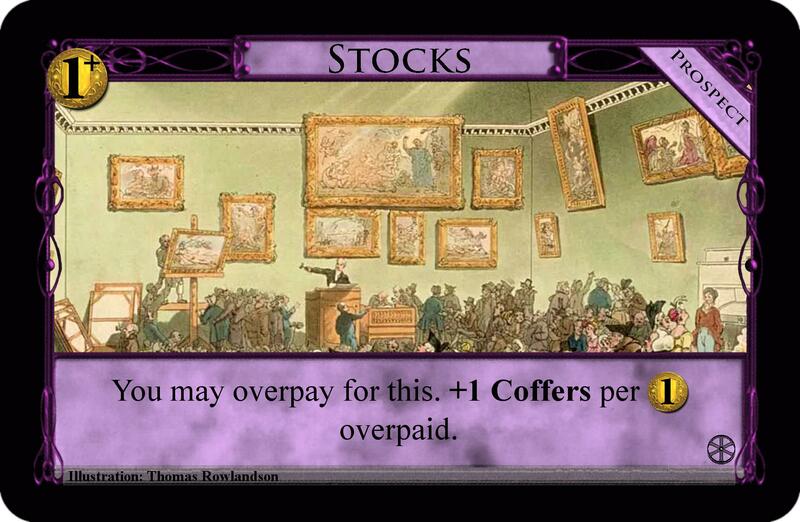 When another player trashes a card, you may return this to the Supply, to gain a card costing up to $5. He starts out as a Copper in Action form. But you invest with him; if either the pile empties or you catch someone else trashing with him in your hand, he can become a much better card. There's a catch to be aware of. When someone reacts with him, the pile is filled up more. Players are kept on their toes as the entrepreneurs seek out their next venture. +: this weakens trashing whilst adding player interaction, two great things. -: drawing to 6 cards may not quite be the emptying bonus to go with. Farm - Action Duration Victory, $6 cost. For the rest of the game, for every Victory card you gain during each of your turns, draw an extra card for your next hand. Make your expanding green space useful. A Hireling that increases the size of your next turn's hand for every Victory card you gain this turn. It's a Victory itself for some self-synergy, and for VP that stays out of the deck when played. +: it has the feel of being interesting, assessing whether the improved consistency when greening late game is worth the investment early. -: could be too dominant in making your greening phase full deck draw too often. Foreign Art - Treasure, $6 cost. When you play this, take Delayed and put this on it. Intriguing and valuable art from overseas, but trading with it takes ages. Here's taking Delayed for yourself. You get a big spike of money, but you have to wait for what you buy, or make that spike a little less, or use it just for Victories. This also delays itself so it's all about the spike. +: this opens up new strategies in buying things to save for later. -: it could compare too favourably to Wine Merchant. Furnace - Action, $4 cost. When you buy this or play it: trash a card from your hand. If it costs $4 or more, +2 Coffers. If it isn't a Treasure, you may trash another card from your hand. A trasher that works on buy for immediate use. 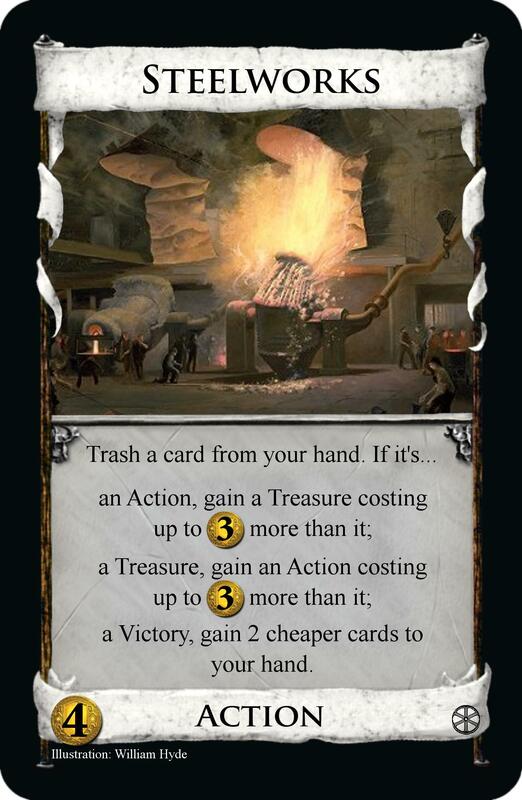 Good cards can become Coffers, and non-Copper junk fuel to burn more junk. When a Furnace trashes itself, you get both Coffers and more trashing. +: some interesting decision making involved. -: possibly too strong or doing too much. Glassworks - Action, $2+ cost. You may take Exhausted. If you do, +1 Coffers. When you buy this, you may overpay for it. +1 Villager per $1 you overpaid. Glassworks range widely in size, from small domestic businesses to industrial scale. Bigger establishments come with more workforce. Overpay for Villagers on a cheap card, quite simple. The on-play effect can let you turn an extra Action into a Coffers. So it can in effect let you convert your Villagers info Coffers and vice versa. +: Simple and effective, hopefully. -: + $2 +Coffers could be too much for a $2 to give, especially if opened with. Jailer - Action Attack Duration, $5 cost. 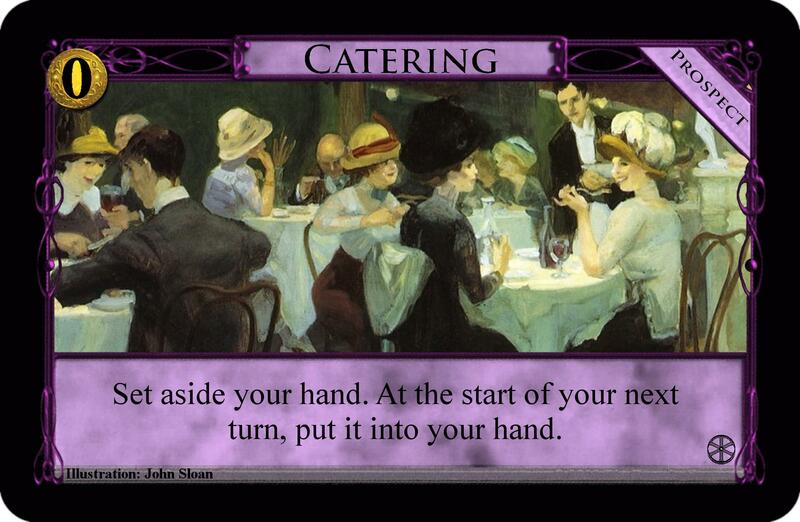 Each other player with exactly 5 cards in hand reveals their hand and sets aside a card that you choose. After they draw their next hand, they put it into their hand. At the start of your next turn, +3 Cards. 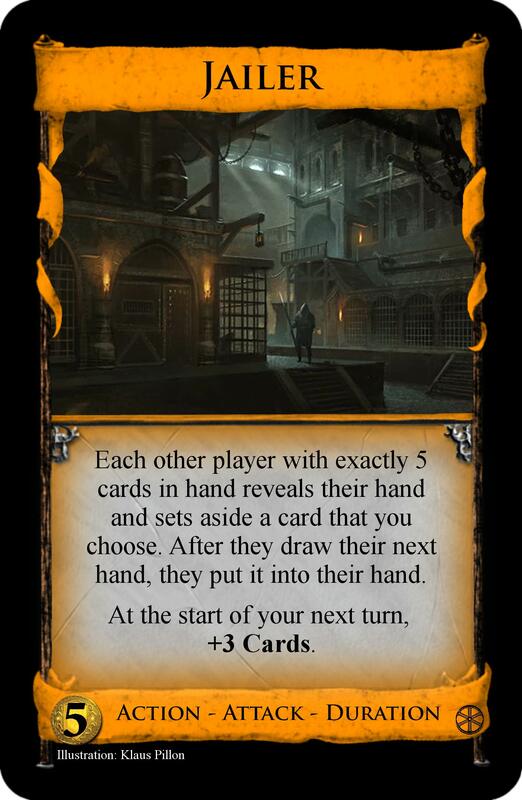 Put one of their cards behind bars for a turn, but next turn it will be released into their hand of 5. Decimate their combos, do general damage, but do so carefully so as not to make their next turn too good. Keep in mind you can't lock someone up from a hand of 6 so easily. +: an Attack needing some skill that fits right in the mega turn theme. -: maybe too strong initially, the same as Pillage. Local Art - Treasure, $5 cost. When you play this, discard a card for + $2. When you first gain Local Art on each of your turns, +4 Cards, +1 Buy, then play any number of Treasures from your hand. An expression of the local area, drawing the people of your kingdom near. Once every turn, you can gain this to draw 4 cards. Then you can play Treasures; this makes buying it not so bad, and overall gives it a lot of different uses depending on when you gain it and what kind of deck you have. The on-play is a weak Silver to balance this. +: a lot of uses makes for a lot of different strategies available with this. -: it's very radical and could easily be imbalanced. Playwright - Action, $3 cost. Look at the top and bottom cards of your deck. You may trash one of them. 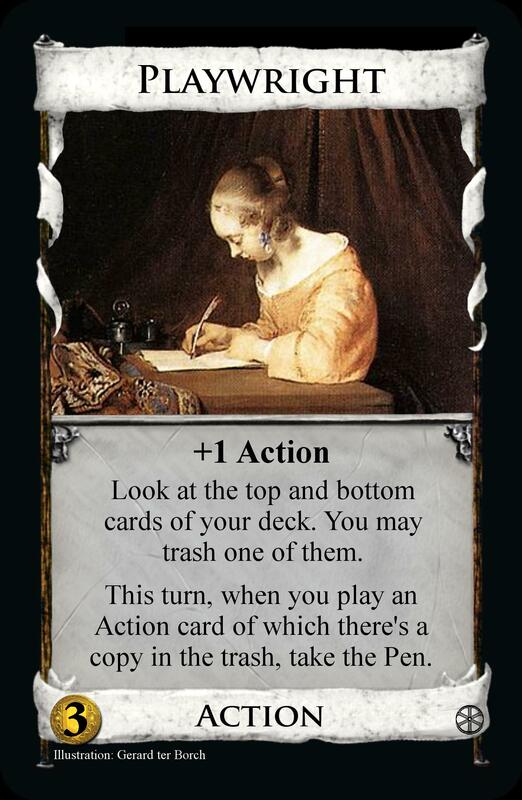 This turn, when you play an Action of which there's a copy in the trash, take the Pen. 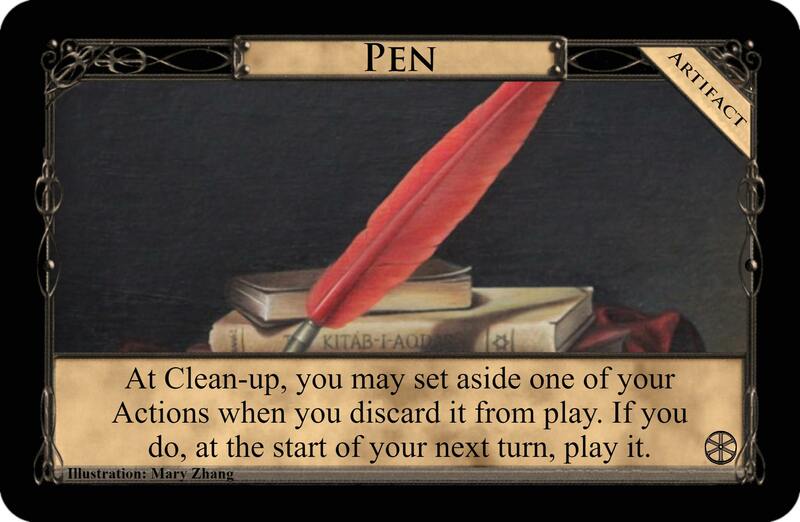 At Clean-up, you may set aside an Action when you discard it from play. If you do, at the start of your next turn, play it. The pen is mightier and all that, it just seemed cute to have writers squabble over a pen like treasurers a key, as well as extending the Renaissance theme directly. Play the Playwright and then a copy of an Action in the trash, and you get a better Prince. So players decide what Actions take the Pen, choosing carefully or adapting to what opponents trash so as to write the story of stronger turns more often than everyone else. +: this seems like a nice way to get an Artifact. -: perhaps too game defining, or not simple enough. Potteries - Action, $5 cost. Take Delayed. Gain up to 2 non-Victory cards onto it with a total cost of no more than $8. Artisan work on a big scale, but still there is no speeding up pottery. 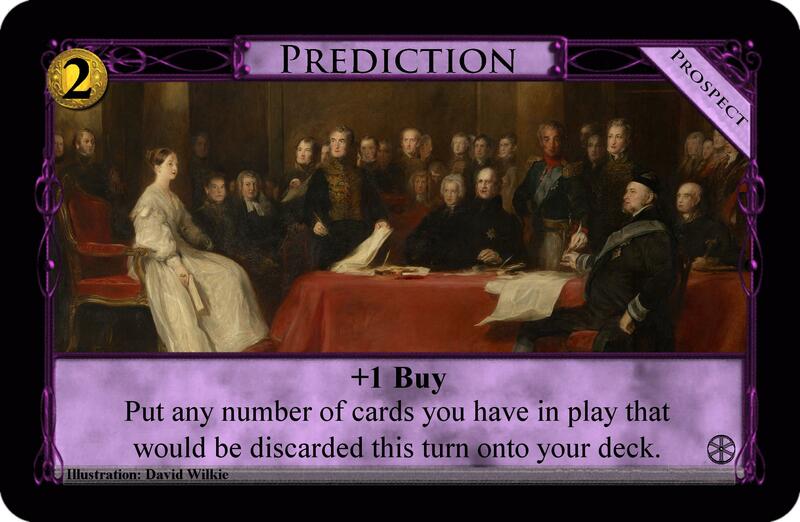 You can build the deck well with this, at the expense of a worse Buy phase - what you buy will be delayed as well, before you can take your gains off. And getting 2 cards will mean $2 is needed to get them in the deck, so don't always get your full $8's worth just because you can. +: powerful but calls for strategy. -: that it can gain big cards like Prince might mean it's imbalanced? Revolters - Action Attack, $4 cost. Each other player may take Exhausted. Those who don't gain a Curse. They've been worked too hard in awful conditions, and they want your opponents' workers to agree with them. An Attack that tries to take an Action away from the opponents. Forcibly doing this would be imbalanced, so they can instead have a crow for their troubles. +: it adds a new decision for players to think about. -: it's a shame that this is basically a curser, that trashing and the Curses emptying make the -1 Action part trivial. Steelworks - Action, $4 cost. a Victory, gain 2 cheaper cards to your hand. Work with oxidised iron. A remodel that has niche but strong upgrade paths but doesn't let you get Victories. +: its precise function will vary a lot from game to game so can be quite replayable. -: it could simply be too niche to be worth doing with Remodel and Expand. Taskmaster - Action, $5 cost. 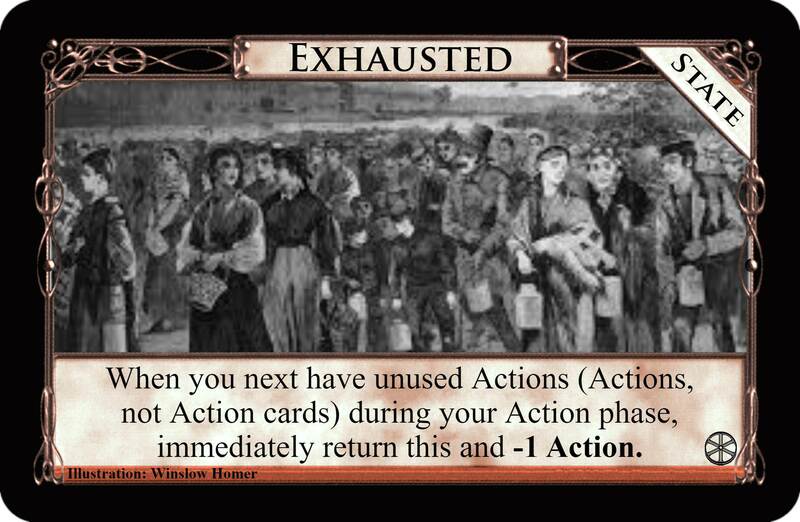 During your next turn, when you play an Action card from your hand that gives +1 or fewer Actions, you may first take Exhausted. If you do, play the Action twice. Stretch your workforce to its limit. It lets you Throne almost anything you like for a turn, but for an extra Action each time; you can't do Villages because you're not supposed to gain Actions! You get 2 Villagers beforehand to help play at least one thing twice. +: it has a natural feeling to it, like somehow this card should exist. -: potential could get too much. 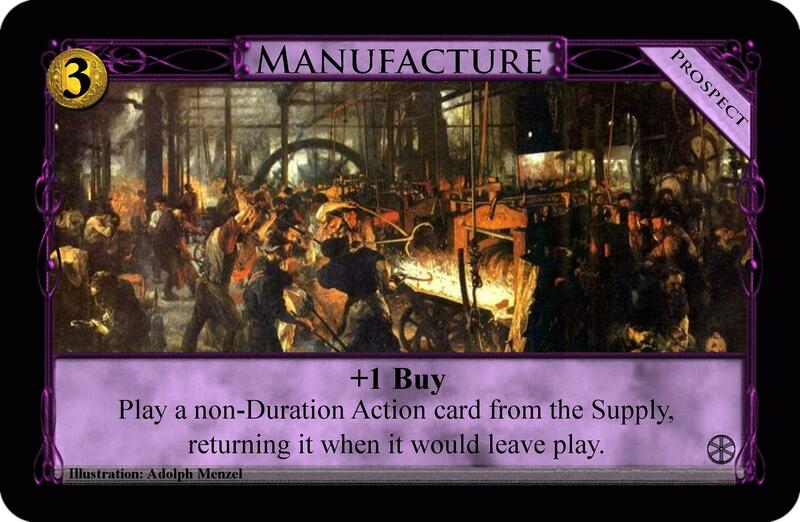 Textile Mill - Action, $5 cost. You may take Exhausted. If you do, +2 Cards. A big place needing lots of people, quickly spinning cards through the deck. A draw card with a choice on how much you draw. If you want more, you'll use an extra Action for it. There are times you want less. +: one of the simplest things to do with Exhausted, and it's effective. -: could either be weak overall or too good with big money. Timepiece - Action Duration, $4 cost. Now and at the start of your next turn: name a type. Reveal the top 4 cards of your deck. Put the cards with the named type back in any order and discard the rest. One plans ahead much better when they know the time. Sort out the top of your deck to be vaguely what you need, and move things you don't want there on. What type you need now can be different starting next turn. +: this has many different uses, yet isn't useful all the time. -: two sort effects on one card may be too much for some people. Trade Circle - Action Reaction, $4 cost. Choose one: gain a Silver; or trash a Silver from your hand for +3 Coffers. When you put a card on top of your deck except during shuffling, you may discard this to draw the card and get +1 Coffers. You can get Silvers and/or trade them away for more money in Coffers. This can be quite niche, so the Reaction adds more function. With the various ways to put a card on top of your deck - put them back after a reveal like with Seer, or any "onto your deck" instructions, but not Star Chart - you can discard this to draw that card instead with a Coffers bonus. +: a new and hopefully interesting Reaction space. -: possibly 3 is too many Coffers given out at once. Tutor - Action Duration, $3 cost. neither type, discard it and +1 Card. An education in efficient industry. Set aside a card and do something with it that benefits the typical engine next turn. +: always a safe pickup but kept an interesting choice by how slow it is. -: safe and balanced, nothing that wrong with it. 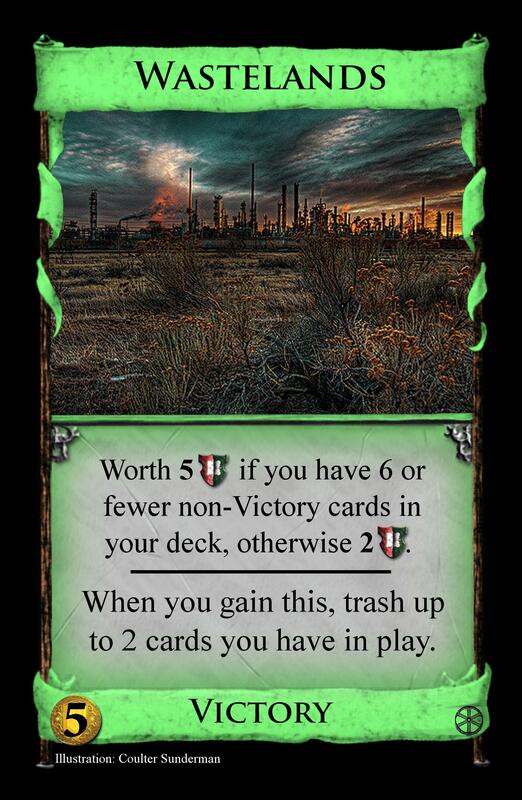 Wastelands - Victory, $5 cost. Worth 5VP if you have 6 or fewer non-Victory cards in your deck, otherwise 2VP. 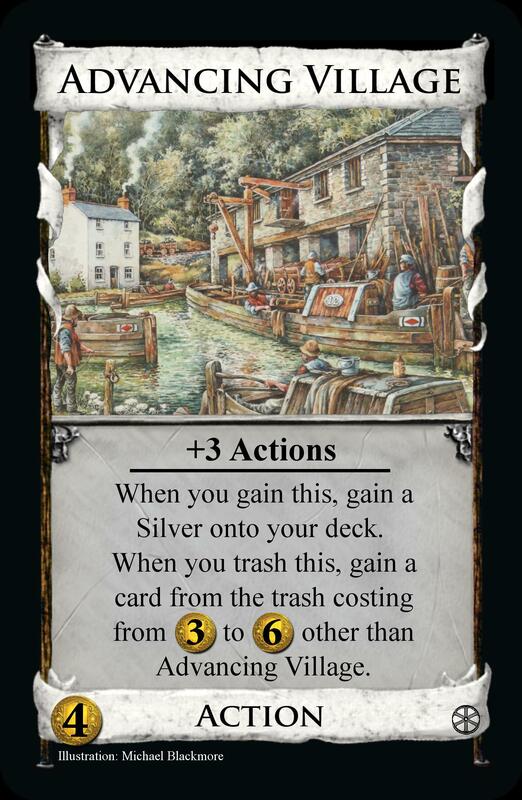 When you gain this, trash up to 2 cards you have in play. The more wasteland you own, the implication is the more productive your factories are. It rewards having few useful cards in your deck at game end, and has an on-gain that helps achieve this. +: it makes a new way to win the game that takes strategy and skill. -: may overall be too dependent on other sources of trashing. Overall: it's a Treasure Map variant that once you put together becomes a card that can discard itself, so you can draw and play it multiple times the same turn. This supports and can be upgraded to one of three powerful final outcomes. 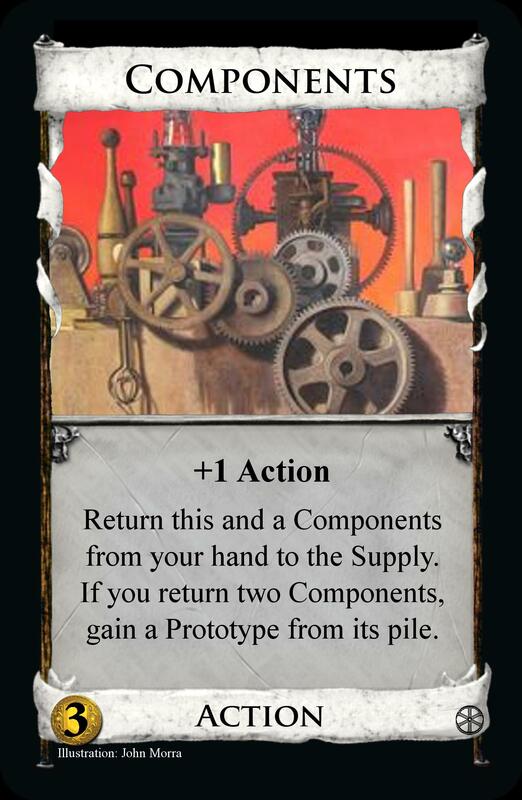 Components - Action, $3 cost. Return this and another Components from your hand to the Supply. If you return two Components, gain a Prototype from its pile. It's a time of innovation, so you turn your hand to making your own machine. Simple returning Treasure Map variant, at $3 with +Action so it's easy to connect them up multiple times or remove them from your deck if they didn't work out soon enough. -: maybe Treasure Map isn't the best start to the group. Prototype - Action Treasure Machine, $0* cost. Exchange this for a Machine. Your first attempt works great first time, but it's hard to get working again. Every upgrade has the Machine type for cleaner, shorter wording. 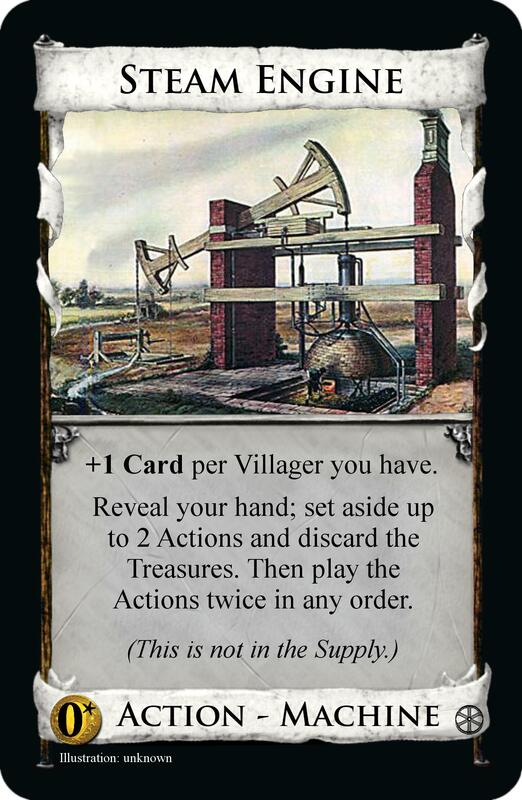 This gets 2 Coffers and Villagers, so nothing to track if you choose to keep exchanging this for itself (essentially discard it during your Action phase). Or you exchange it for an upgrade: the Action Treasure typing should make sense when you see them. +: self-discard is a new interesting mechanic. -: that this puts an upgrade straight into the discard pile to draw the same turn adds some swinginess. Could be too many tokens given. Steam Engine - Action Machine, $0* cost. +1 Card per Villager you have. Reveal your hand; set aside up to two Actions and discard the Treasures. Then play the Actions twice in any order. You finalise your machine into something that can attach to other machines to run them automatically on steam power. This final upgrade is a big boost to playing Actions, but not Treasures. With a well managed pile of Villagers, it can be a key engine piece. +: it should reward play skill handsomely. -: it may call for too much work or be too narrow in its uses, although it likes the last Machine Patent. Spinning Mule - Treasure Machine, $0* cost. While this is in play, when you spend a Coffers, +1 Card. Or make your machine into another invention of the time, something that takes the labour out of spinning threads. The final upgrade going down a Treasure route. It adds draw to every Coffers so they can draw more Treasures to play. +: it makes a pleasant yet simple contrast to Steam Engine. -: is it powerful enough? Patent - Action Machine, $0* cost. When you first get a Patent, choose an Action from the Supply that has no copy on another player's Patent mat. Move it onto your Patent mat, leaving one bonus visible. Your Patents' instructions become the bonus followed by the instructions on the Action. So when you first get this, choose any Action in the Supply and put it on your mat, which looks something like the mock-up on the right. Choose one of +2 Cards, +2 Actions, +2 Buys or + $2, and cover all the mat with your chosen Action except that bonus (you might rotate the bonus to be shown above the card). Patent becomes the Action with that bonus on it first. Name, cost and types don't change. Say you choose Smithy and +2 Actions. 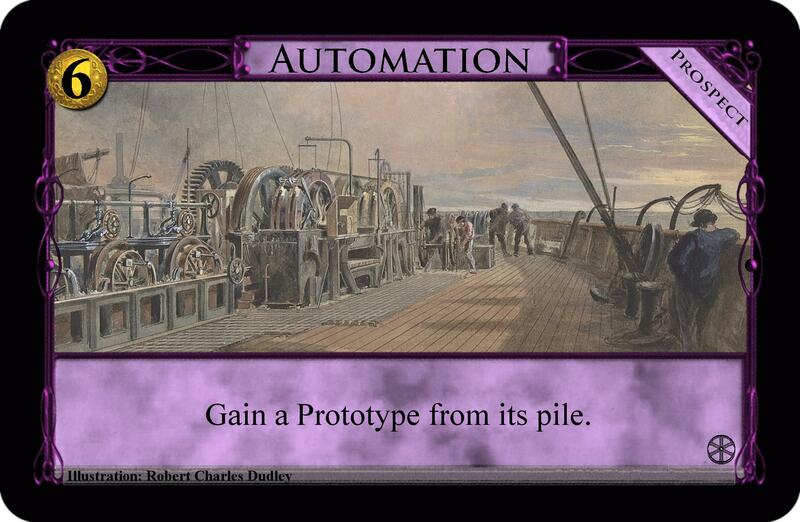 You now have a card that reads: Patent, Action Machine, $0 cost, +2 Actions, +3 Cards. Patent will always be this for you this game. So make a super powerful Action, and patent it so no one else copies it. +: it's a new way to get ahead in the game, and it should work well in this group of cards as Steam Engine can be a consolation prize to the loser of a best-Patent race. -: could still be too influential if only 1 or 2 cards are clearly dominant with it. Having an Attack that isn't Attack type could be bad... Or is that good? Just like Projects, they're effects you buy once and then put a cube on. But unlike Projects, they are one-off boosts that happen right now rather than ones that last for the rest of the game. So the cubes are there to track that you have used the Prospect and can't use it again. Automation - Prospect, $6 cost. Gain a Prototype from its pile. You can get a Machine ready made this game, just one, so choose how best to use it. 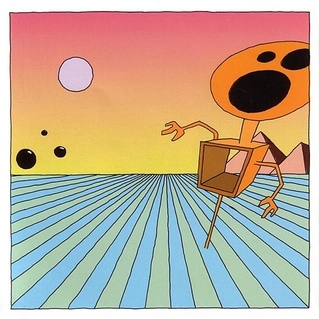 +: all the thoughts of managing a single Machine. -: the price might not be quite right. Catering - Prospect, $0 cost. Set aside your hand. At the start of your next turn, put it into your hand. Carry your hand over to next turn, adding it to the 5 you draw. +: a mechanic effective on a one-off, and it can be free. -: probably weak, or it's trivial to time. 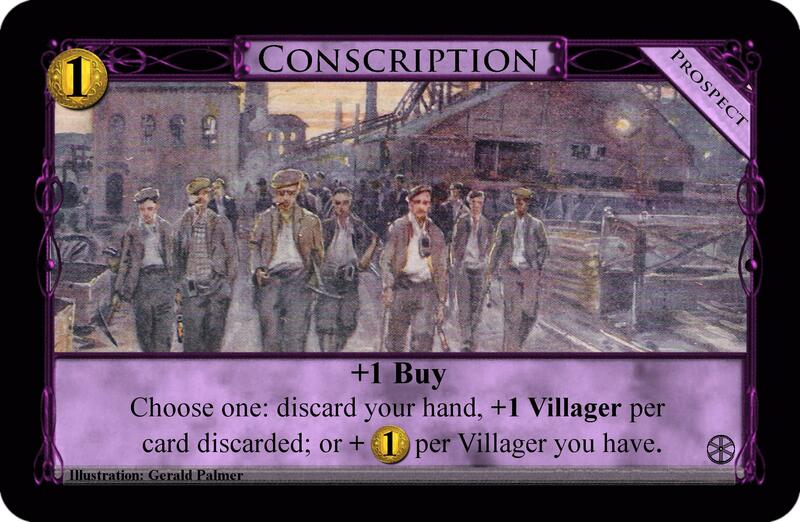 Conscription - Prospect, $1 cost. Choose one: discard your hand, +1 Villager per card discarded; or +$1 per Villager you have. Resource conversion to time optimally. Change your Villagers into economy once, so hoarding them can be a strategy. Or if there are no Villagers cards, you can change your hand into Villagers. +: more new strategies is good. -: some people may want to try using this twice? Consumerism - Prospect, $0 cost. This turn, when you buy a card costing $1 or more, +1 Buy. Infinite Buys for a turn. Use for essential early purchases or build to a massive $ mega turn. +: something that's felt useful yet missing from the game quite often. -: possibly something's broken about this even though it's only one turn. 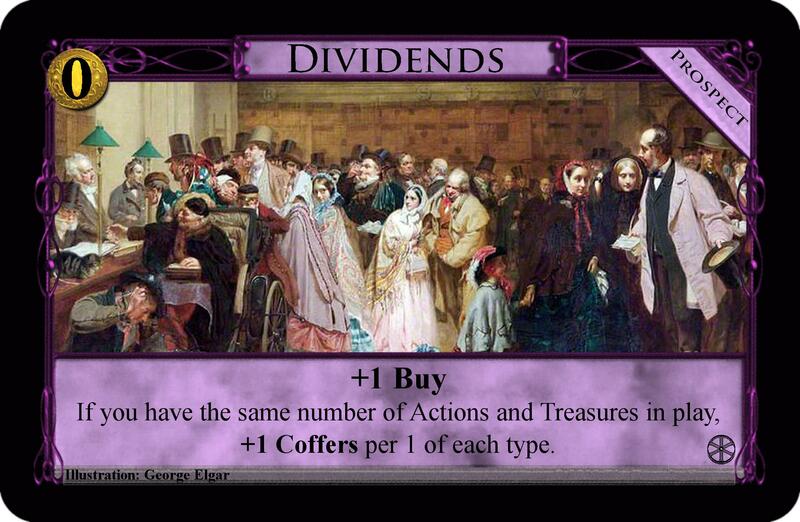 Dividends - Prospect, $0 cost. If you have the same number of Actions and Treasures in play, +1 Coffers per 1 of each type. Count the number of times each type appears across the cards in play (Crown will be one for both), then if they're the same you get a Coffers for every Action (consequently every Treasure too) you have in play. Free Coffers you might work to getting or take whenever it's convenient. +: There are lots of ways this set and Renaissance can get the same number of each type in play, making hopefully compelling replayability. -: could alternatively feel mundane, if one never works for lots of Coffers. Exhibit - Prospect, $2 cost. Take the Emblem. Gain either a copy of a non-Victory card you've gained this turn, or a card costing up to $4. An Artifact that you can only take once. You choose when you want it; it has a distinct early game boost in gaining a $4 for $2, a late game boost in VP, and a middle game boost in gaining a copy of a good card you've already gained that turn. +: it's an elegant way to get 3 different uses on the same card. -: it could be annoying with regards seating order, especially with keeping possession for late game. Manufacture - Prospect, $3 cost. 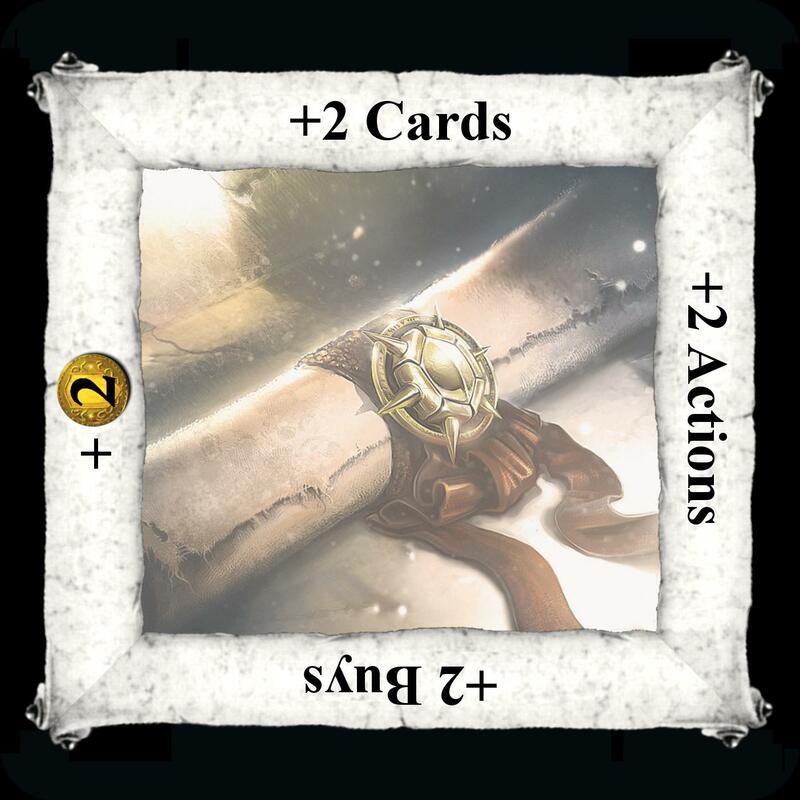 Buy the effects of an Action in the kingdom to use immediately, without adding the card to the deck. This opens a fair few possibilities to weigh up. +: its uses will differ each game, and players work out for themselves what's best. -: there could be something broken somewhere? 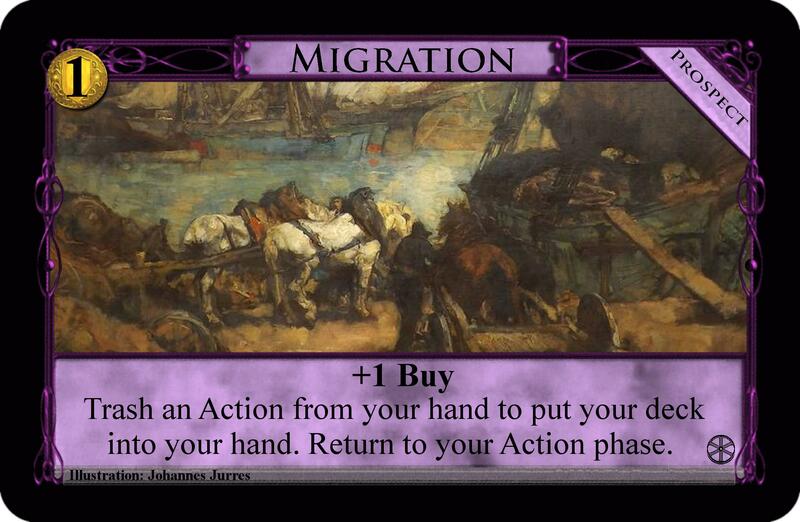 Migration - Prospect, $1 cost. Trash an Action from your hand to put your deck into your hand. Return to your Action phase. Put your whole deck into hand at once, at the cost of an Action card. Time it when you have the right Action to lose and a tiny discard pile if any at all. +: A new means of card movement opens up new strategies. -: maybe too cheap or swingy. 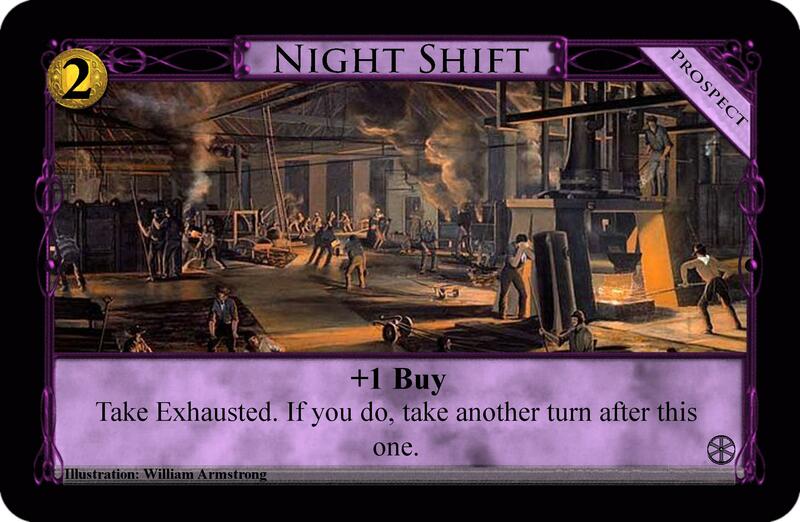 Night Shift - Prospect, $2 cost. Take Exhausted. If you do, take another turn after this one. One extra turn typically without the starting Action to prepare and time right. +: one bonus turn in the game is interesting, and a bonus turn without the starting Action is interesting. -: this was what inspired Prospects in the first place. I don't think I have any bad points about this one unless it's too cheap. Prediction - Prospect, $2 cost. Put any number of cards you have in play that would be discarded this turn onto your deck. Replay stuff next turn. When do you really need to do this? -: it should work? Maybe it's a bit uninteresting. Progress - Prospect, $2 cost. Take half the tokens on this (round up) as Coffers, the rest as Villagers. When a card costing $4 or more is gained, add a token to this. 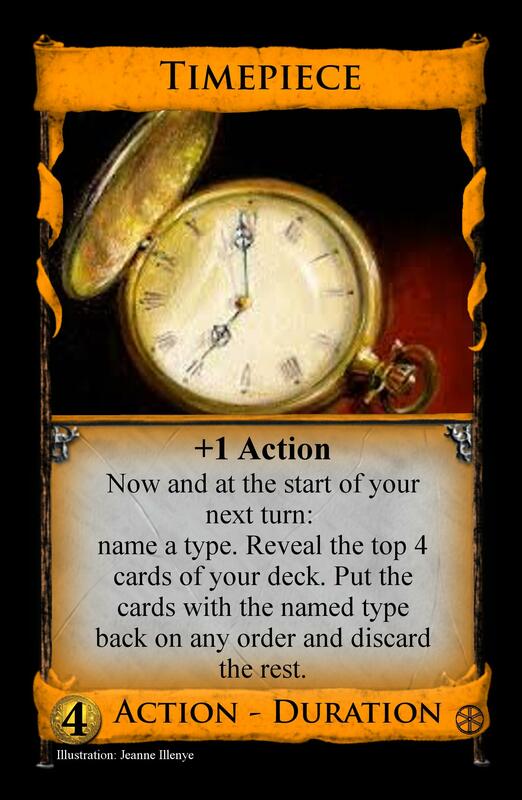 A passive accumulation of tokens that players have to time taking. When do you need them, can you take them away from opponents when they really need them, can you try waiting for more? +: lots of strategy to consider. -: can be hard to remember adding a token each time. 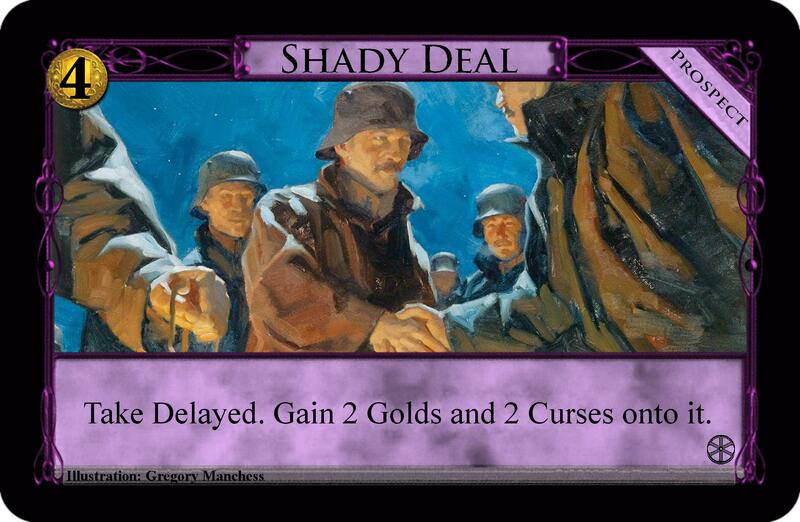 Shady Deal - Prospect, $4 cost. Take Delayed. Gain 2 Golds and 2 Curses onto it. Get a massive economy boost, but with the setback of either Delayed that's hard to remove and/or crows in the deck. Dance around these how you will. +: it's all about resource control. -: maybe too automatic too often? Stocks - Prospect, $1+ cost. You may overpay for this. +1 Coffers per $1 overpaid. Save some of your money from a turn for later. +: overpay for Coffers can be achieved on a one-off. -: timing may be trivial, that you always do it on a $3/4 or 4/3 start to get $5s. 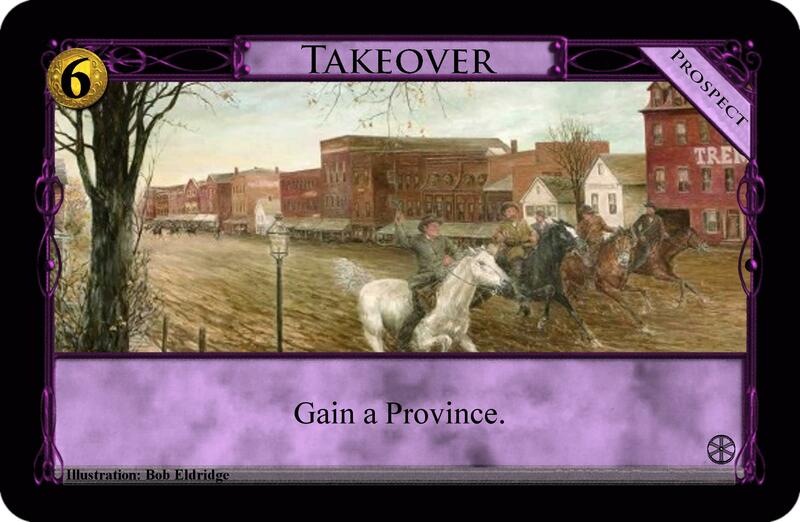 Takeover - Prospect, $6 cost. One of your Provinces this game costs $6. When will you get it? -: possibly just a boring speedup to the game? And that's the end. I hope you've enjoyed looking through these as much as I enjoyed making them. Maybe you've seen a mistake or flaw somewhere, in which case don't be afraid to tell. No design can be called perfect or final without criticism, and part of the thrill of the design process is identifying and making gradual improvements. I suggest to post less cards at once. I understand why you would want to share all of your ideas at once with us, but given there are no pictures, this is an incredibly long wall of text. Many people won't even start reading it, as they will get tired of it before finishing. I'm saying this before taking any look at your actual cards, just as a friendly tip: Less at once means more detailed feedback, and probably more altogether. Taskmaster - Action, +1 card +4 actions. If there are any unused actions at the end of your turn, draw 2 less cards for your next turn’s hand, down to 3. $4 cost. On a German forum I already encountered something like this, where spending all your Actions was necessary to achieve something. I think it's not too great to punish somebody for overproducing, though. As I said about LastFootnote's Charlatan already, overproduction is in itself a punishment, as you waste something you put effort in. That said, it doesn't look unbalanced. With +3 Actions it'd maybe even pass as a regular 4$? I don't know. Or just give the penalty every time. Just, I'd suggest to not punish for failing to use your potential. Potteries - Action, +4 cards. You may use a second action on this. If you do, +1 buy, + $2. $6 cost. You might like to check out my Town/Road (click the link in my signature) on how I did spending two Actions on one card. It seemed easier to me back then. And I'd say it is if you only do one card with that ability, but here of course you made it a recurring thing. Which means that yes, you have to learn something new, but you get a whole new bunch of cards that use that thing. That said, I'm not sure how good or bad Potteries is. It seems better than Hunting Grounds, but I'm not sure how much better. Advancing Village - Action, +1 card, +2 actions. 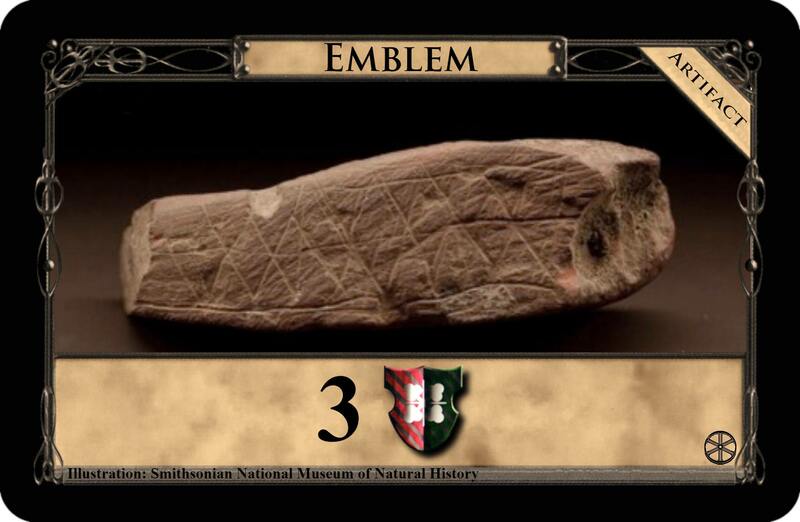 If this was played from your hand, take an Action Token. $5 cost. I don't get what you say about "replaying itself infinitely". 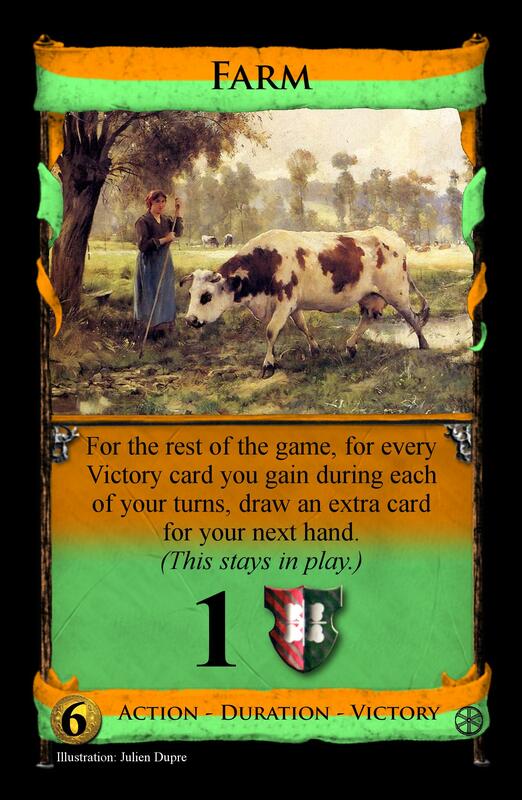 If the +1 Action token just gives you +1 Action, however would you play this card again? Executive - Action, +1 card. Discard any number of Treasure cards. Take an Action Token per card discarded. While this is in play, when you spend an Action Token you may use the action on the last one you played. I don't get the last part. Is the +1 Action Token supposed to be something like Royal Carriage? Because if it's just "When you play an Action card, you may use an Action token to get +1 Action", what would "use it on the last one you played" even mean? While this is in play, when you spend an Action token, you may replay the last Action you played instead of getting +1 Action. Although I can't find a perfect wording either, I think that's clearer? I suggest to post less cards at once. Good call. I should thank you both for reading what you have. Edit: so I split them up according to their mechanics. Reverted as they looked more clumsy dotted around. I am slowly working on images for each card. So you play Executive, and discard some Treasures to get some action tokens. If there are no actions left after this, you would pay a token to gain +1 action in the usual way. You can choose to play an action from your hand at this point. Or you can use the action you just got from the token on the Executive, since it is the last action you played. So it would still count as using an action, and you would again have none left. Now the difficulty with wording; suppose after the Executive you play Potteries, then pay another token and use the action on the Potteries. You are using 'a second action' on it and would get the Woodcutter effect. If you were to 'replay' the Potteries like with Royal Carriage you would replay the card and get 4 cards again. I should explain that when I wrote the commentary for each card in my own notes, the rule on Executive was always what action tokens did. I changed them for simplicity and then made Executive to keep the effect. I just forgot to update this. 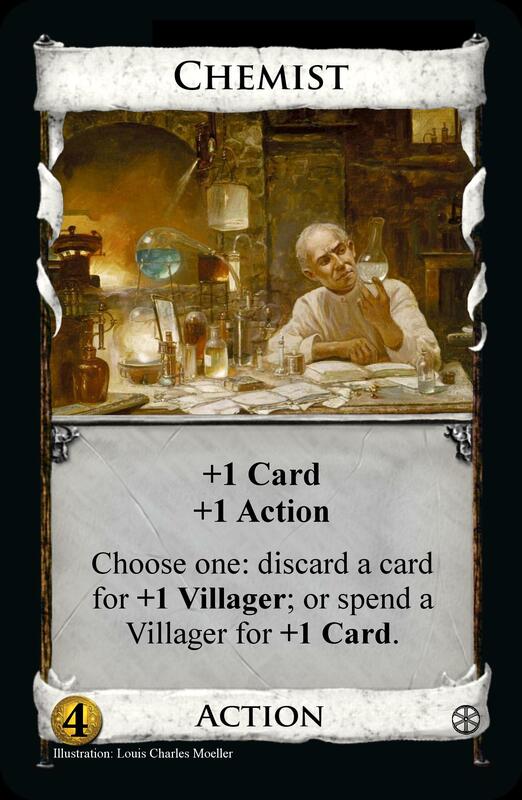 So with an Executive in play, you'd play Advancing Village, gain a token, which you use on Advancing Village, gain another token, etc. Edit: adjusted the comments on each card. Hum, I'm really not sure I like the idea of being allowed to re-play cards that are already in play. It seems wonky with Durations, at least. If you want to keep that ability, you should fix up Executive instead of altering other cards that give out the token: "While this is in play, when you play an Action card from your hand, you may first spend any number of +1 Action Tokens to play that card that many additional times." That would stack with several, though. An alternative would be to just introduce an own type of token: "Take that many Executive Tokens..."
Some adjustments thanks to your feedback. I guess a lot of confusion arises with this whole 'second action' idea. If we remove that things should be easier. I can do what I did to the unnamed remodeler, 'choose one... You may use two actions on this'. Glassworks - action. Choose one: return up to 2 cards from your hand to the piles they came from, and you may gain a card costing exactly the sum of the returned cards; or draw up to 6 cards in your hand. You may use two actions on this. $5 cost. Should play just the same, only Thrones let you do one then the other too. 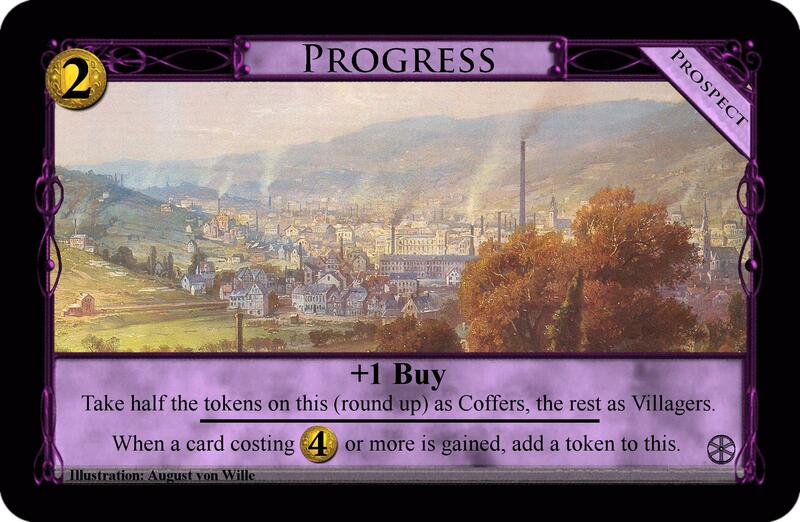 Potteries - Action, choose one: +3 cards; or +1 buy, + $2. You may use two actions on this. $6 cost. Steelworks - Action. Choose one: draw up to 9 cards in hand, then put 3 cards from your hand on the bottom of your deck; or reveal your hand, and if there are… 3 or more Treasures, + $2; 3 or more Actions, +2 actions; 1 or more Victory cards, +1 buy. You may use two actions on this. $5 cost. This is quite a bit stronger; you can reveal your hand twice for 3 actions and/or $4, but it'll be harder to get with a 4 card hand. 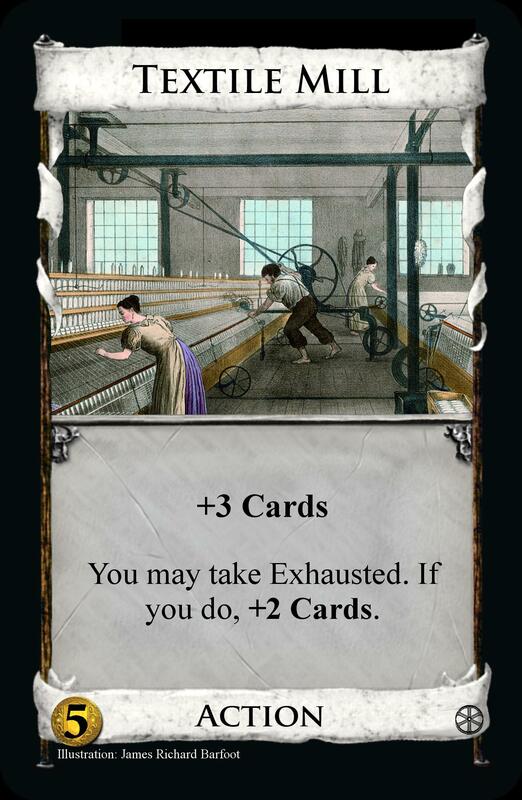 Textile Mill - Choose one: +1 card per card in your hand, discard up to 3 cards then put your hand on top of your deck in any order; or gain a card costing up to 4 into your hand. You may use two actions on this. $5 cost. The Workshop part gains to hand to work better with the first part, but would two 4s to hand be too strong? Taskmaster - Action, +1 card +4 actions. When you gain this, draw 2 less cards for your next turn’s hand, down to 3. The skill element is still there. There could be some complex reason to gain one just for the effect. Executive - Action, +1 card. Discard any number of Treasure cards. Take an Action Token per card discarded. While this is in play, when you spend an Action Token you may replay the last action you played instead of +1 action. $6 cost. Expert - Action. Choose one: +1 card, +1 action, +1 coin or +1 buy, then replay the last action you resolved that is not an Expert. $5 cost. 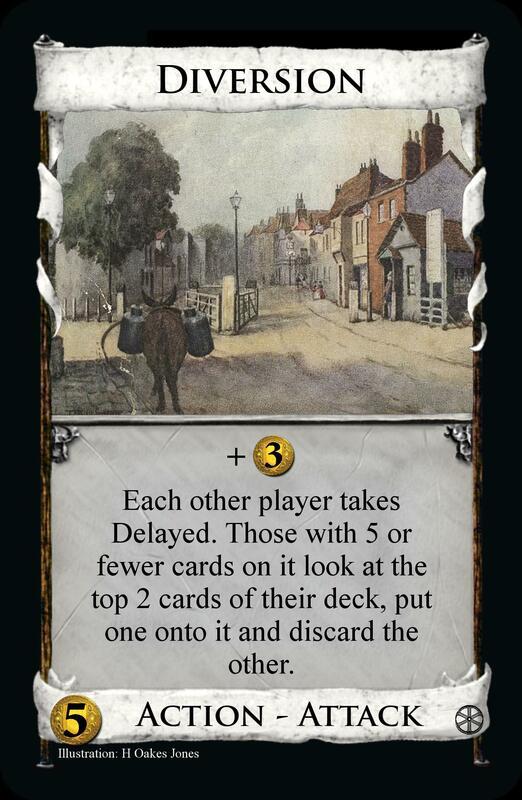 About replaying durations, the instructions for Royal Carriage seem to imply you can only do so on the turn you play them, and not on their later effects. If you do so the card stays out with it for easy tracking. It wouldn't make sense with Hireling otherwise. And it can't replay reserves as they're never in play after they're resolved. So, with the cards changed to be like this, the same rule would apply, the action token (Executive) or Expert card staying with the duration. It's not at all clear what "you may use 2 actions on this" means. To me, it reads "you may play this card and have it consume 2 actions instead of 1", with no additional effect. Do you actually mean "You may use an additional Action to play this card a second time"? Consumerist - Action attack duration. Each other player reveals their hand at the start of their turn and plays all Treasure cards, then pays all their $. They may gain a card costing up to the amount. At the start of your next turn: +1 card + $2. $5 cost. Split your opponents' total coins for the turn in two. 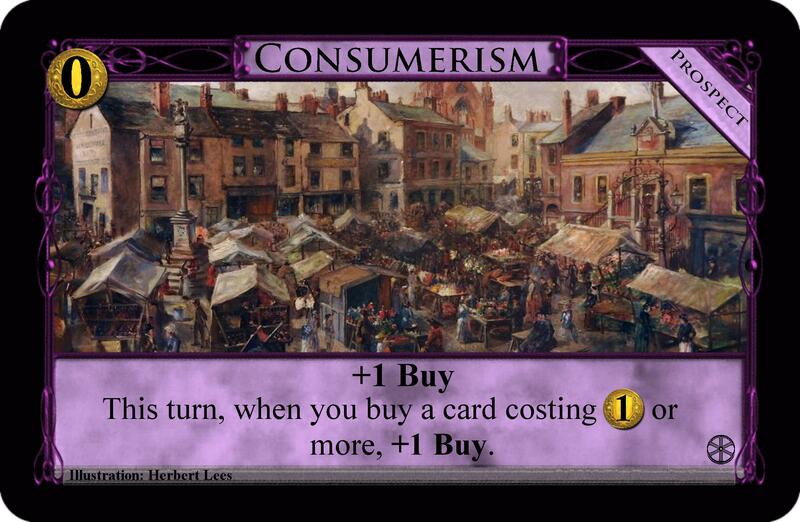 It has them gain a card to save Black Market-like confusion, particularly involving debt, and it prevents on-buy effects too. This may be strong, or at least swingy in its impact. This has serious problems with Crown. You are forced to play Crown, but it's your Action phase, so uh I suppose you can throne an Action. What if I draw more Treasures? Do I have to play them? Am I allowed to play them? And what if I discard some of the Treasures in my hand? Am I still required to play them? Similar problems, to a lesser extent, occur with Counterfeit - did I play the counterfeited card and have thus fulfilled the requirement to play it, or does Consumerist line up the cards in your hand for play and you have to play them even when they stop being in your hand? And if I Counterfeit Rocks to gain a Silver in hand, what about that? Unfortunately, I do not have a good idea of how to fix these issues while keeping the premise. Other than that, I would add that gaining a card at the start of your turn rather than at its end is usually considered a bonus, so I'm not sure the attack is strong enough to be worth it. These cards give you an extra optional effect, if you pay Actions. Think of how Butcher lets you pay Coin tokens, and then that gives you an extra benefit. Here, you pay Actions for the extra benefit. Take Potteries for example (using the version from the first post). When you play it, it's just like Hunting Grounds. Then, you can pay another Action (if you have one) for +1 Buy, +$2. I find the wording on these cards a bit confusing, especially considering the explanation on how Action tokens work. The card texts themselves should be enough to explain how the card works. The alternating back and forth between 1st action part and 2nd action part seems too complicated. The concept of "using two actions" is certainly ambiguous and should be reworded. Potteries - $6 Action - +3 Cards, You may pay an Action. If you did, +1 Buy, +$2. This wording would be consistent with Storyteller, but still might be a little ambiguous on its own because Action is an overloaded word in Dominion (see Diadem). Actually, if you want to be consistent with Diadem, you may want to say "You may pay an unused Action", but I'm not sure that's necessary. As for Action tokens, you could make them work just like Coin tokens from Guilds. Instead, you would have, during your Action phase, you may spend an Action token, for +1 Action. I think that is what you intended, though I'm not sure. I would think, though, to prevent some rules problems or confusion, you would want to limit when Action tokens can be spent to after completely resolving an Action, or whenever you "may pay an Action". 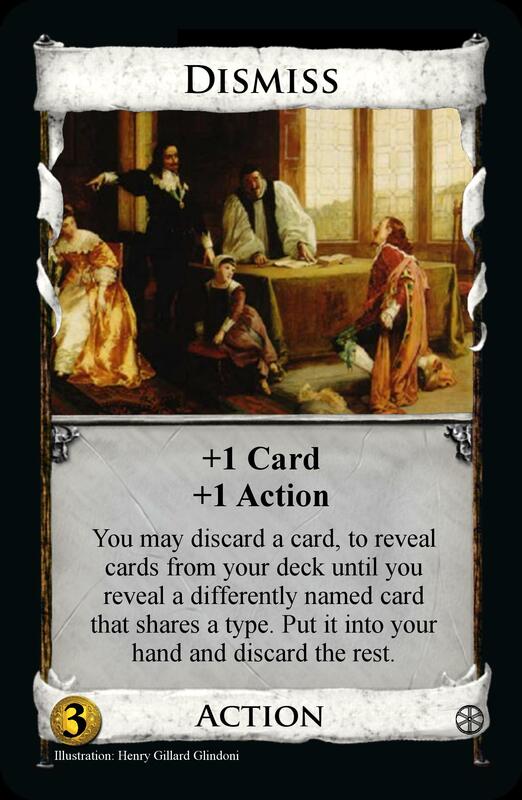 Unfortunately, by Executive changing Action tokens into Royal Carriage effects, the only reasonable time to be able to spend Action tokens is after completely resolving an Action, which doesn't work nicely with the "may pay an Action"/"use two Actions on this" cards. Honestly, though, Executive is overpowered and probably needs to change anyway. A single Executive and a single Bridge can end the game in just a few turns, as soon as you can get 7 or 8 Action tokens and collide Executive and Bridge. Some interesting card effects here. Haven't even looked beyond the Action theme yet. Some good observations, thank you all. "Each other player starts their next turn with a Buy Phase, in which they keep their hand revealed and play all Treasures. (They still have a Buy Phase after their Action Phase.)" The potential this has is when a player can hit 8 but only with the actions he has. Instead he gets two buy phases with less than 8 to spend. "Choose one: +3 cards; or +1 buy +$2. You may use a second action on this to replay it." I never did explain did I? Well this is exactly what I thought. Ah yes, I had kept my Canal in mind but I suppose a Bridge-Silver opening would be too fast. If I limited the number of Treasures it could discard to 2? "While this is is play, when another player starts their turn, they reveal their hand and set aside all Treasure cards. Then they play the cards set aside in any order." This still has weirdness with Crown, but the rules should be clear; any additional Treasures are not played. It nerfs Counterfeit since you don't get to trash anything, but that's fine. On power level: I get that, but hitting $8 is only really important late-game; maybe the attack hurts very early as well if you would reach $5 with Action + Treasures. Mid-game, gaining the card and being able to play it the same turn may well be a bonus; providing virtual +buy may be a bonus too. Attacks that are sometimes beneficial can work (see Haunted Woods) and it's an interesting way to attack a player, but I think the other effects of the card are too weak. I think this might be OK, but I would drop the word "second" because it's confusing (or re-word depending on what you want the card to do). Consider the case where you do use a second action to replay it. Then you are faced with the same choice: "You may use a second action on this to replay it". But what does that mean now? Are you not allowed to, because it would be a "third" action? Or are you allowed to? For that particular play of the action card, it's only your "second" action. That's the reason I think something like "You may pay an Action to replay this" would be more clear. Also keep in mind that as written, this lets you pick +3 Cards each time, if you want. 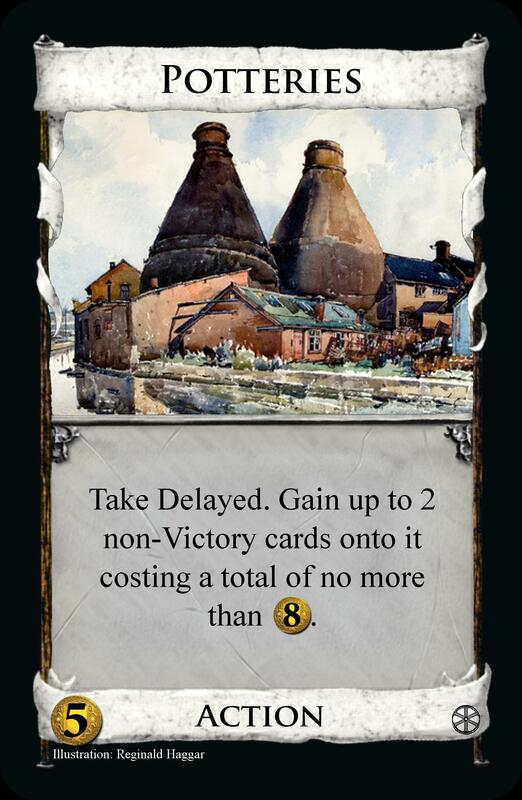 Note that the first play is a Smithy, but each subsequent play is a Hunting Grounds (because you don't have to play another card from your hand for the effect). So this might be too strong, when there are cheap villages. First, it's a hard to track how many buys and coins you have. Admittedly, my Road can't track the Actions it used, either - but here you're counting 3-dimensional: Coins, Buys AND Actions. 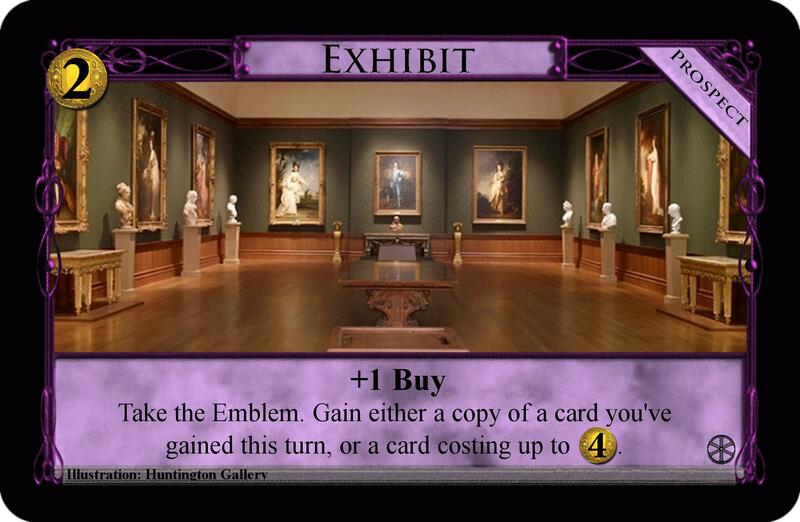 Second, my card isn't in the supply as a +1 Action token on it would draw your deck. That still works with Champion, though that's a bit harder to achieve and kinda over the top either way. Here it's worse, because the card actually generates unlimited amounts of coins and buys, which means putting the token here and drawing one=Victory. Third, Road comes with a Village for the reason that it gets easier to balance without being useless from time to time. Lastly, the wording: If I played this at first with a Herold, Throne Room or something like that, I never spent a "first" action on it, so may I actually use a "second" one? "You may use an action to do this twice." Tracking which effect you choose each time is a valid point. When it comes to the number of times you replay an action with Executive or Expert or if you 'use it twice' you can put an action token on the card for each extra time. An idea for indicating which effect you chose is put the token on the picture for one effect and on the text for the other. For some tracking cases (such as maybe KC-Pawn or Courtier) you just have to be creative. You may pay/expend/use up/lose one of your Actions, to choose a second time (the choice may be the same)." If you have unused actions, you may choose a second time (the choice may be the same). If you do: -1 Action"
Action. You may use an extra action to do the following twice. Choose one: trash a card from your hand and gain a card costing up to 2 more than the trashed card; or look through your discard pile and put a card from it into your hand. 5 cost. Canal - +1 buy. You may use an extra action on this. If you do, cards everywhere cost 2 less this turn, but not less than 0. 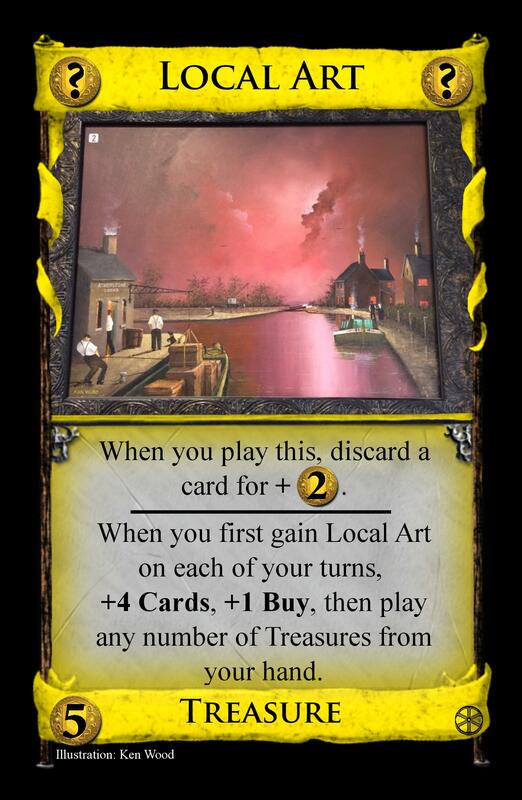 For the first time Canal is played on your turn, when you gain a card, you may gain a Treasure costing up to 4. 5 cost. 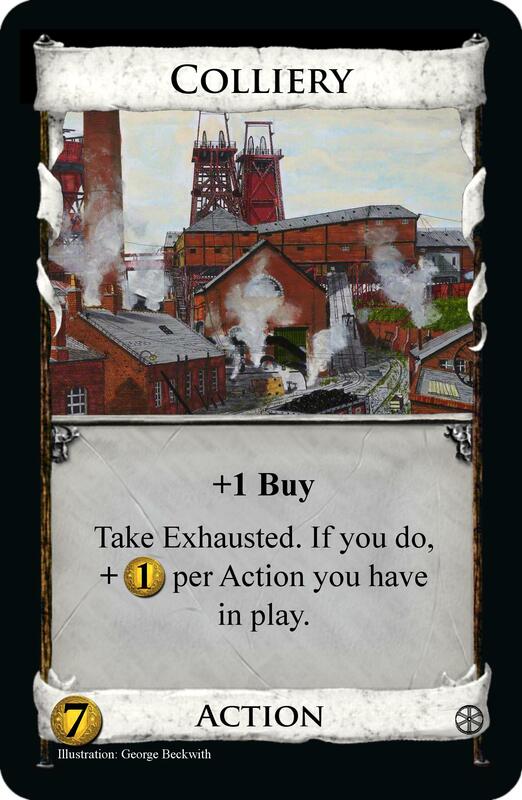 Colliery - +1 card. You may use an extra action to do the following twice, or two extra actions for three times: +2 coins, discard a card. 4 cost. Glassworks - You may use an extra action to do the following twice. Choose one: return up to 2 cards from your hand to the piles they came from, and you may gain a card costing exactly the sum of the returned cards; or draw up to 6 cards in your hand. 5 cost. Potteries - You may use an extra action to do the following twice. Choose one: +3 cards; or +1 buy, +2 coins. 6 cost. Does this make complete sense? Do they need the 'extra' there? Cameo - Treasure, +$2. Take an Action Token. You may put a card from your hand on top of your deck. $4 cost. Patency - When you first gain this, set aside 2 different Action cards other than Patency from the Supply costing up to a total of $8. When you play this, it becomes the action on the left until it is resolved, then, unless this has left play, the one on the right. $7 cost. Wording adjustment that should play durations and reserves in a balanced way. Put a Reserve on the left and the right card never gets played as Patency goes to the Tavern mat, leaving play. If a Duration is the left card, then we follow on from what was discussed earlier with Royal Carriage's interaction with durations; it is resolved after the immediate turn's effects are completed, not the later ones. 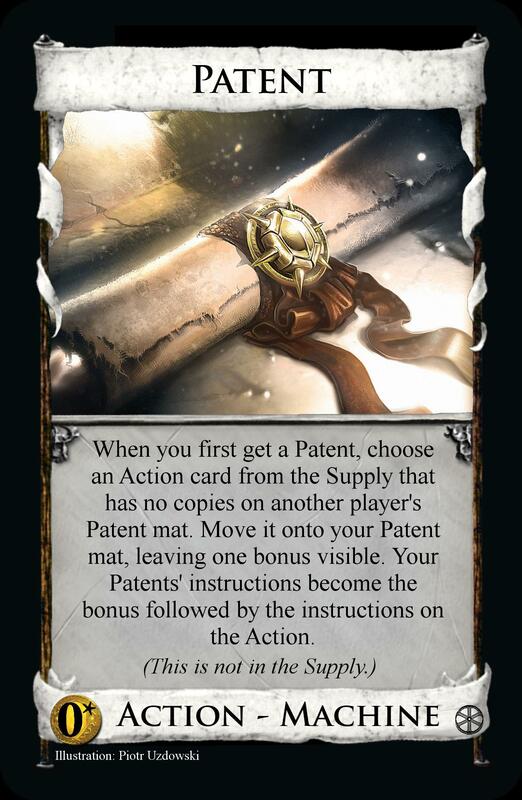 Patency will then become the right card, thereby cancelling the next turn effects. So no shenanigans with Tactician or Hireling. And if either are on the right, they play normally. Well, that was wordy... I hope you get it. A problem with this wording is that it's not clear what happens if you choose not to use an extra action. I know you intend it to mean that you do the part that follows a single time, but it's not clear from the wording. The way it reads, you don't actually get any benefit from playing the card at all unless you spend additional actions. Something like "Otherwise, do it once" is needed, which could be in parentheses. I like Asper's suggestion of "If you have unused Actions, you may ... -1 Action". It doesn't require any additional rules and it's not too wordy. The only problem is that it doesn't work nicely with every possible clause you have after it, but if you have something like discard a card, it's pretty clean. Colliery - +1 Card, +1 Action. Do this three times: If you have any unused Actions, you may discard a card, for -1 Action, +$2. Updated the OP with wording changes and hopefully clearer commentary on each card. 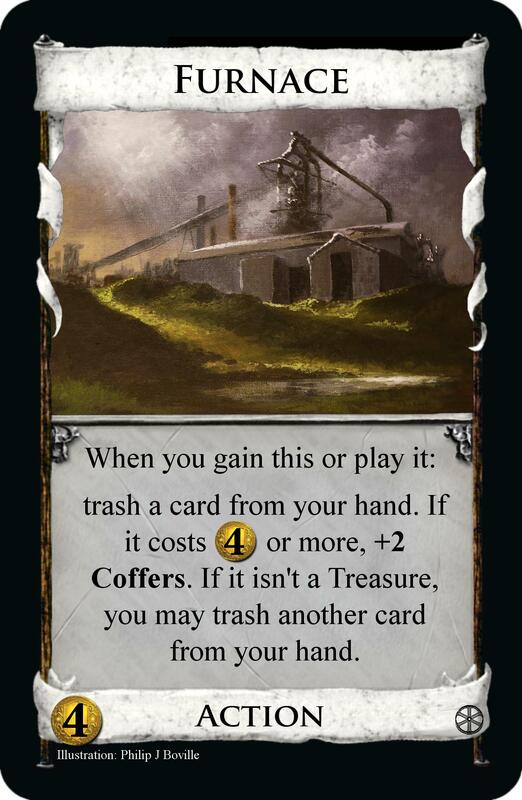 Colliery - +1 card. You may do the following once, use an extra action to do it twice, or two extra actions for three times: + $2, discard a card. Potteries - Action, You may use an extra action to do the following twice. Choose one: +3 cards; or +1 buy, + $2. 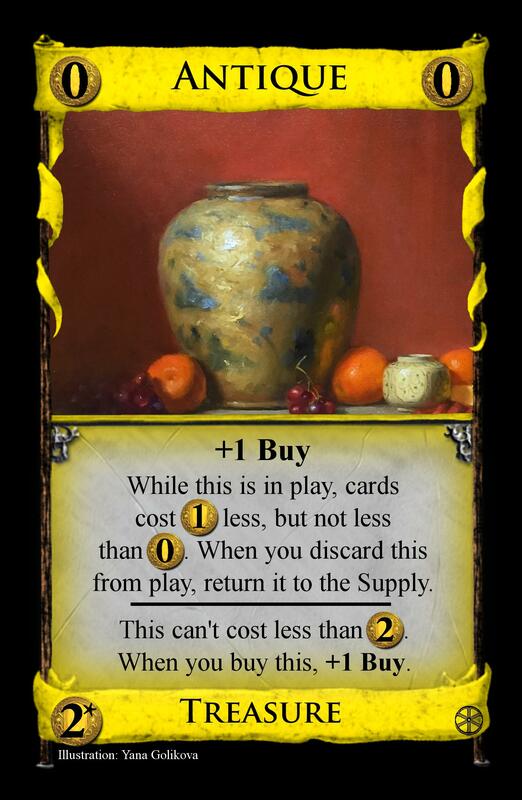 Potteries - choose one: +3 cards; or +1 buy, + $2. If you have any unused actions, you may choose again for -1 action. Potteries - +4 cards. If you have any unused actions, you may do: -1 action, +1 buy, + $2. I would appreciate opinions as to what format is best. I realised making Consumerist start turns with buy phases gets really wonky with Villa, so before bothering to get the wording sussed, is his attack too weak based on faust's reasoning? I've put all the cards that use multiple actions under the type 'Multi'. It's a clean solution that makes wording much shorter and simpler. All Multi cards call for -1 action to do extras in various ways, and the rule simply is you can't do such effects of you have none left. 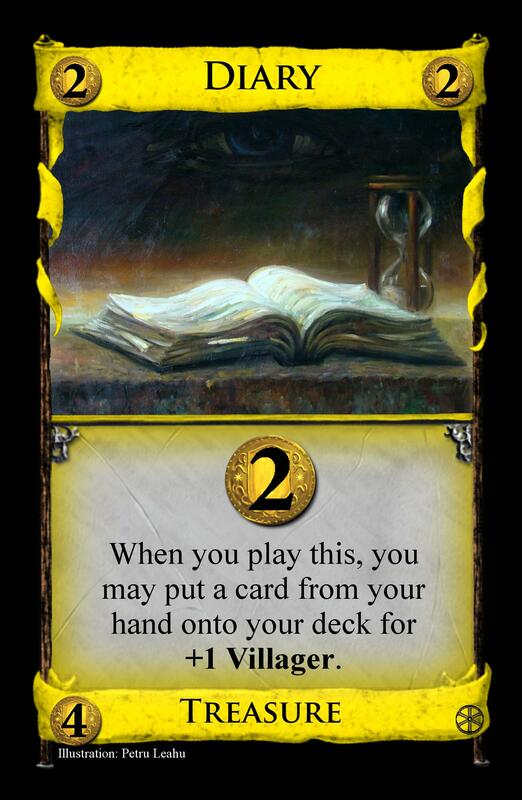 Advancing Village (was 5 cost 1 card 2 actions take token) now gives tokens when you gain cards. It seemed better to not simply give tokens out on a simple cantrip, but to make it a bit more challenging to get them. Cameo similarly gives its token if you do top-deck a card. It's bumped up to 5 like the other silver+ Treasures. Glassworks now trashes cards rather than returns them to the Supply. It actually progresses to the game end now, and plays nicely. each other player reveals their hand and sets aside all Treasure cards. They take another Buy Phase after their next one with them, with +1 buy. At the start of your next turn: + $3. Entrepreneur now gives +1 buy on pile empty. It basically takes what Labourer ​tried in being a delayed Market, so Labourer can now go. discard up to 2 cards. Take an action token per card discarded. While this is in play, when you spend an action token, instead of +1 action you get: +1 card, and you may play an Action card from your hand twice. Patency is now Patent, again actually something real, and it needed​ to become a Multi. You choose one set aside Action, and can then do the other for -1 action. At the start of each other player's Buy Phase during their next turn, they get -1 action. If they have no actions left, they gain a Curse. At the start of your next turn, +1 action. It doesn't quite seem right as is, it'll need a bit more work. draw up to 8 cards, then discard down to 5; or reveal your hand, and if there are... 2 or more Actions, +2 actions; 2 or more Treasures, +1 buy; 2 or more Victories, + $2. +2 cards and gain a Silver to hand; or look at the top 5 cards of your deck, discard any number, then put the rest back with any number from your hand in any order. 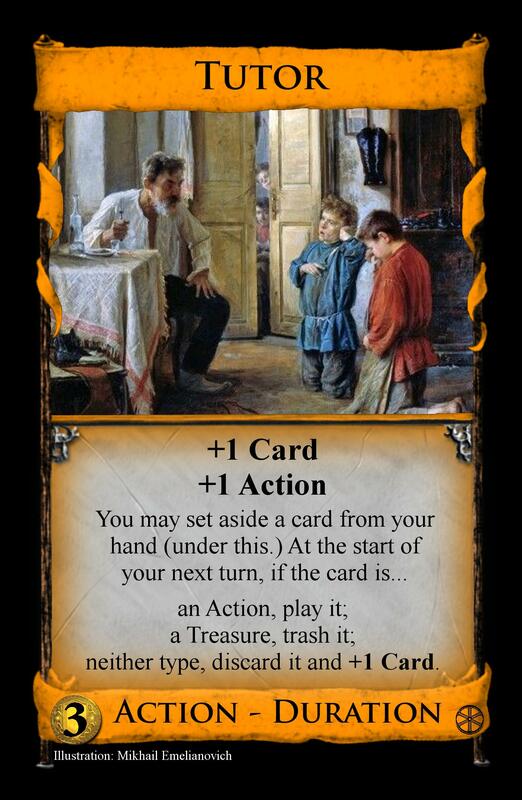 Labourer (+1 action, +1 buy, if 3 or more actions have been used this turn +1 card +1 coin) didn't look very interesting alongside Entrepreneur, as explained above. Taskmaster (+1 card +4 actions, on buy draw 2 less cards for next hand) lost its appeal once I started thinking action tokens. Toxic Waste (while in play cards not in supply cost 1 less, when other player plays a card costing 1 or less they gain Curse) tried too hard to be different, and was potentially too strong. I could make Revolters a much simpler curser. The OP has had an overhaul to make it a hopefully simpler read. I haven't really read through everything, but kudos for updating an expansion based on playtesting! That doesn't happen a lot. Colliery was insane, but removing the +card has reined it in. I'm now trying it as an overpay card, $2 +1 action token per 1 overpay. Looking fine at the moment. Glassworks got decks going too fast, with trash and good draw together. It's an outtake. Potteries was so good it's silly. Straight to the outtakes. Textile Mill was in the same boat as Potteries, with +2 cards +2 coins (in the form of to hand silver) together. But with Potteries gone, I'm trying +3 cards on it instead. No problems with the others yet. And Hawker's been weak. I've got an idea in line for a fix, but it hasn't been tested yet. Incinerator - Action, $3 cost. Trash up to 2 cards from your hand. If you trashed a Curse, trash up to 2 more cards from your hand and + $1. Innovator - Action Multi, $5 cost. + $3 and play up to three Treasures from your hand; or pay all your $ to buy a card immediately, gaining it to your hand. Locusts - Action, $4 cost. Set this aside. Trash a card from your hand and one from the Supply costing up to $5 other than Locusts. At the end of your turn, trash this and gain a Locusts. Incinerator - Interesting. Reminds me of Plastic Brain's Medicine. It might be a tad too good with curses or a bit swingy. Innovator - IDK about the -action, but the rest should be just gaining. "Spend all of your $, then gain a card to your hand costing up to the total $ spent." I don't think you need the option to do only one, right now the card seems too good. I could really be underestimating the -action though. Locusts - Looks really good. A cantrip trasher for 4, that gives you a free $5? Sure, it has limited uses but it's a guaranteed opener. Even with 5, you need to grab one to at least contest the pile. Playtesting hasn't been that thorough like this, but it's come a long way to get to something close to balanced. It's fair at buying Treasures, as you lose out on total coins for the Buy Phase, it's buying Actions that's been the trouble. You either need enough virtual coin played before and 2 actions left, or enough Treasure in hand and 3 actions, to play the Action card of choice straight away. Both involve a bit more than just a Village, so it's not so scary an opener. I think you have a card similar to this on your thread, one called Munitions, that buys a card like this onto your deck for $3 cost. Maybe I should test it for strength. Hmm, it doesn't gain the card costing up to 5 but trashes it from the Supply. That would of course be too strong. Did you maybe misread it because it says '...costing up to 5' and not '5 or less'? Lose any amount of $. Gain a card costing at most the amount you lost to your hand. Obvious comparisons are Minion and Royal Seal. Royal Seal can use its effect later in your turn and can't be drawn dead, but it's topdecking is quite a bit weaker, lacking both the implicit +1 Card and the implicit +1 Buy. About Multi cards, I am against the subtype. 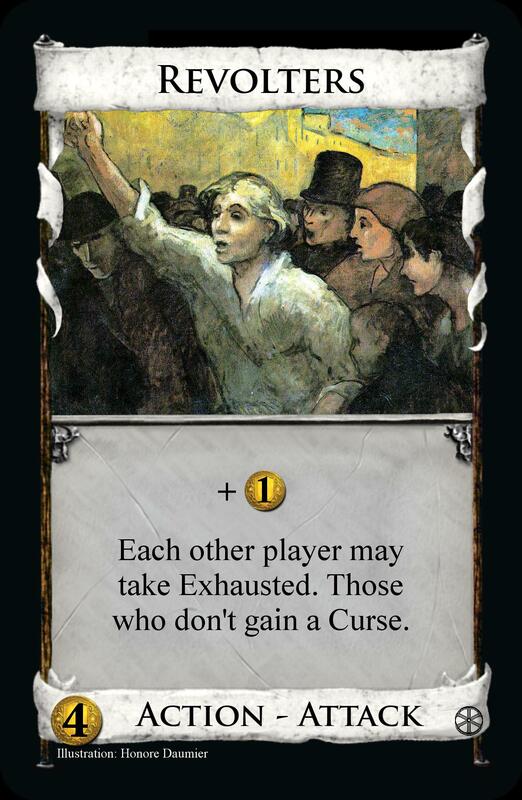 You don't need a new type for each mechanic, intrigue didn't come with "choosing" type cards. You say it's for simplicity but it doesn't make things simpler. Even if you want to keep the type, I'd change it. Regarding the multi cards, I think you should have -1 Action tokens. Whenever you would have to spend an action (other than playing a card), if you have no actions you may take a -1 Action token. These are basically the same as debt. You can't take more -1 Action tokens if you have some and you have to play them off with Actions.